**** Updated March 2019. This post contains affiliate links. I am finally updating this post. 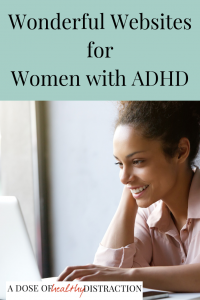 Wonderful Websites for Women with ADHD, is an adjunct to my list of ADHD Experts. If you are a woman living with ADHD, parenting a child with ADHD, or just want to know who to trust for information, this list of Wonderful Websites is for you. These two explain the stuff you need to know, as an adult with ADHD or as a parent of an ADHD child. They explain it in an easy to understand format that you can read in less than an hour. Great advice and support on this website. They are both parenting coaches and they run fantastic coaching programs such as Sanity School, which I took! Sanity school teaches you how to be a coach to your child. She is an expert in adult relationships and the impact of ADHD on marriages and interpersonal relationships. I love that Gina Pera is not afraid to take on the medical establishment, or fame-whoring celebrity therapists. Ms. Pera does amazing research into topics relating the ADHD and finds a way to explain them so that they feel relevant to your life. Her points are clear and well informed. Her insight is excellent, and she is fearless. I like that in a writer! I am partial to this website because I like mellow vibe of their website. Not to mention that I am the Dear Abby of Adda. I answer questions via email and I love it. This website is easy to navigate. Membership costs $50 per year, or $5 per month and is well worth the price. You get access to online support groups and many webinars with guest experts. Adda hosts the Annual International Conference on ADHD along with CHADD each year. Terry Matlen’s book, The Queen of Distraction (affiliate. Full disclosure) was the first thing I read about women with ADHD. Over the last year or so I’ve been fortunate enough to get to know her better, and now I consider her a dear friend. She is knowledgable, approachable and just…the best! If you are looking for more from Terry check out her Queens of Distraction group. She offers special deals several times per year. This goes without saying. The CHADD website is a wealth of information. There is a fee if you want to join the organization individually. But I frequent this website for general information, as well as attend the conference so I am a member. CHADD posts some interesting content on Facebook, and has the only network of in-person support groups that I am aware of specifically geared toward ADHD. If you are at all interested in learning about ADHD, or keeping up to date on the latest research then you should check them out. ADHD Homestead is operated by Jaclyn Paul, who is part of my Facebook Group. Jaclyn writes fabulous book reviews on a range of topics. She also writes her own articles which I frequently share and/or pin. Her new book, Order From Chaos, is available on Amazon. (affiliate) And she promised me she would be on the podcast soon. Her is easy to navigate and there are no ads or annoying popups going on. Jaclyn reads widely and is very thorough in her thought process. I know this because she comments on many blogs and websites (including my own) and her opinions are always well-researched and honest. Or ADDitude, as it is commonly known. I am not sure why I didn’t include this when I originally did this roundup because I referenced this site in my research all the time. Where do I begin? I you want information on kids with ADHD you can find it here. You can also find information on adult ADHD and general lifestyle. This website is open to contributors and one of the most comprehensive sources for information on ADHD I have ever seen. This is another one I discovered fairly recently but have grown to really love. My Pinterest feed is filled with articles from Understood. This website deals with both learning disabilities and attention issues. The articles are wide ranging. My favorite category currently is Friends and Feelings. All of the articles are very well written. They even have a twitter on chat on Wednesdays at noon EST. Use the hashtag #LDChat to join in! So umm, that is the site you are on right now! And yes, it is my site. I would say that I want this site to be a combination of all of the above sites, with a little extra humor thrown in. I like to write articles about topics that are relevant to women living and parenting with ADHD. I am a big nerd, so I love a research challenge. I am not a licensed psychologist or medical professional of any kind. My target audience is women with ADHD who are interested in parenting, self improvement, and more emotional balance. I have always wanted to create my own community off of social media, so I did. It’s the called The ADHD Enclave. The Month of April is FREE.